Members of the Mexican Navy use a helicopter to prevent members of the caravan heading to the United States from entering its territory. 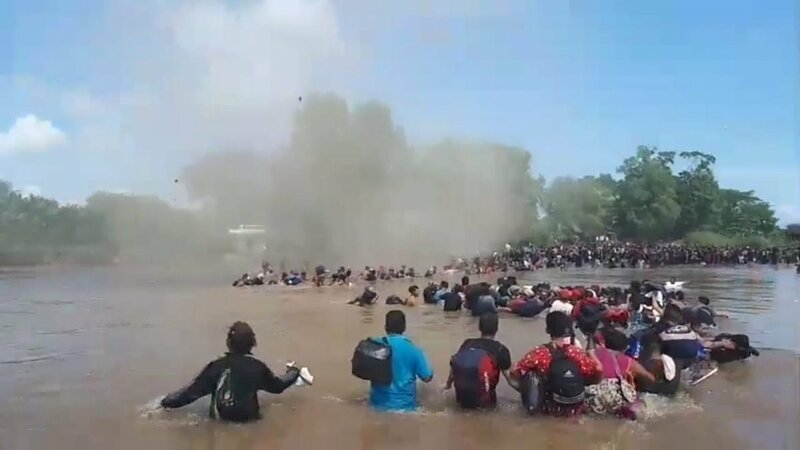 This Monday, while a group of Honduran migrants tried to cross the Suchiate River, the helicopter flew over the Mexican riverbank. This caused dust and water to rise and make it more difficult for Hondurans to circulate. Meanwhile, migrants who are already in Mexican territory left the town of Tapanatepec for the town of Niltepec. There, it is expected that in the afternoon the leaders of the movement will give a press conference. Meanwhile, the president of the United States, Donald Trump, once again pointed out that gang members are marching in the caravan. “Many gang members and some very bad people are mixed in the caravan that heads to our southern border,” he wrote on Twitter. “Please, come back, you will not be admitted to the United States unless you go through the legal process. This is an invasion of our country and our military is waiting for you! “He warned.